As it turns out, molasses comes with an expiry date (who knew!) and mine was about to go bad. I had one last ginger cookies recipe all the way at the bottom of my Pinterest board (making a grand total of four if you are keeping track). This time I tackled the Joy of Cooking’s gingerbread men recipe. Nothing says Lent like gingerbread cutout cookies, right? This recipe called for more molasses than the others, which was a good thing I thought, I would use up the rest of it. I found out too late that molasses is a key component in barbeque sauce, it would have been nice to know after about the second batch of ginger cookies when I still had enough for sauce. Ah well. Turns out I didn’t even have enough molasses for the cookie recipe. My arms got exhausted having to hold the container upside down (even after leaving it upside down for a while) as the last little bit of molasses dripped out ever so slowly, it was agonizing. I only had half the amount needed for the recipe, off I went scouring the internet in desperation. Turns out I could just sub in some brown sugar (which the recipe mysteriously omits). The day was saved!!! This was by far the easiest gingerbread cookie dough to work with, even though it had more molasses than I am used to working with (I guess that would be because it also had more flour). It actually formed into two nice rounds as opposed to the usual ungodly sticky mess that I am supposed to somehow form into round balls (hah, what actually happens is misshapen sticky blobs). At some point I had to knead the dough with my hands. The dough has to be refrigerated for at least two hours which is worrisome because any cookie dough is in danger of eating if I am around. It was fun to break out all my cookie cutters. Nothing says spring-that-is-more-like-winter than gingerbread chick cookies. Were they the best gingerbread* cookies? No. That might be due to the lack of molasses (I am willing to re-do these one day). I still think the Martha Stewart ones by far take the cake… erm, cookie. The cookies are more flavourful, there are a lot more spices in them which is bold and scary- but damn does it taste good. * it is worth pointing out here and now that I have been using the following interchangeably and thus this might not be a fair cookie show-down: ginger-molasses cookies, gingersnaps and gingerbread cookies. They are all cookies. They all have varying amounts of ginger, molasses and allspice. Yes I occasionally sub in allspice for ground cloves, as my kitchen is still lacking. Up next: we have people coming over on Saturday and I want to bake something from the bottom…. dammit. Every time I complain to Brent or my sisters that I tend to neglect older pins, opting for the new “shiny” ones prominently displayed at the top of my board they start singing Drake’s starting from the bottom and it enrages me. But yes, I would like to bake something from then, there is a recipe catching my fancy for pumpkin cookies but the odds of my being able to find pumpkin pie filling at this time of year seem not-so-great. We’ll see. My molasses is nearing expiry, which warrants a batch of cookies of course. It would seem I went through a ginger-molasses cookie phase as this is the third recipe I found on my Pinterest board, also the last. I skimmed the recipe real quick and thought nothing of it, I had all the ingredients. But something did not quite feel right. Was molasses really supposed to just hold all the spices together, making the dough? Where were the eggs, the butter, the sugar? Turns out in just glancing over it I missed the *important* part where they mention making the basic cookie dough recipe first and then adding the molasses etc to it. Oops. Thankfully I caught that before attempting these, that would have been embarrassing. Candied ginger proved hard to find, and when I did find it it was way too expensive to justify buying it. I figured the cookies would be fine without it. The cookies are delicious but not as good as Martha Stewart’s. The recipe is also a rather small batch, which is bad when you are a notorious dough eater. I brought some home for my family- by some I mean one each- and my mom made fun of me saying: oh what, only one cookie? How nice. And we laughed after I explained. And I still have a tiny amount of molasses left. It is driving me nuts. We had tried to get reservations at Bar Isabel, best new restaurant 2013, for our anniversary the week before, however the only time slot they had was 11pm so we instead got a reservation for 6pm the week after, much more reasonable. Down the block from Bar Isabel is Candy Bar, voted best candy store. I had grand imaginings for what this new candy store would be. I assumed it was located where the Coffee Time used to be at College & Ossington. During the walk there all I could think and talk about was all the different types of candy I wanted to buy: chocolate covered cookie dough bites, a Double Decker bar, gummies of all sorts, Skittles and chocolate covered caramel popcorn (this last one I can only ever find at Sugar Mountain). I had grandiose ideas of this candy store akin to Dylan’s Candy Bar in NYC. I can honestly say I was rather disappointed with this candy store. The bulk candy was more expensive than other places, it is understandable for odd candy you don’t find anywhere else like Percy Pigs gummies, but for Reese’s pieces? Really? Most of the other candy we got there can be found elsewhere. The shop itself is also really small. Maybe it is the best candy store outside of downtown Toronto, but for all of Toronto? Sugar Mountain still wins for me. We got to Bar Isabel about 5 minutes after open (we had been eating our candy in a bus shelter, hiding from the rain and killing time until 6pm) and the place was already packed. Apparently it is really popular, soon after we were seated the place was full… and understaffed. The restaurant is small but seats many, and with so few servers we were stuck waiting a while. We started with a plate of charcuterie, we considered a cheese plate as well but it seemed like it would be too much. Instead we asked the server for a tip on what cheese would go well. She suggested the 14 Arpents. Migawd was she right with her recommendation, I normally hate cheese unless melted. This soft cheese was amazing, I could not get enough of it. The meats were OK but did not stand too well on their own. It was fun making mini-sandwiches. Up next we had the spicy squid with fried tongue and kale. One bite and my eyes bugged out of my head. It was unbelievable! Easily the best dish of the night. It made me sad that we did not have more people, or bigger stomachs, I wondered what we were missing out not being able to order half a grilled octopus. After our amazing experience with sweetbreads at Hopgoods Foodliner we decided to order it. I had high hopes for it. Alas it was weird. It was served atop raw tuna. The sweetbreads were warm and crispy, the tuna was cold and chewy- it was all really odd. Then I got a bite of sweetbreads without the safe encasing of deep-fried batter and I gave up on the dish. It tasted like liver and ruined it for me. We were still hungry, one more dish seemed right. We split the chorizo verde sausage. It was served atop a bed of veggies (escarole) that had been soaked through with the sausage grease making it palatable, for someone who hates veggies- I can only imagine what it must be like if you actually like veggies. For our 7 year anniversary we wanted to go somewhere nice. Unfortunately Bar Isabel and Jacobs & Co. were both fully booked for that day, we Bar Isabel had an 11pm opening but that was too late. 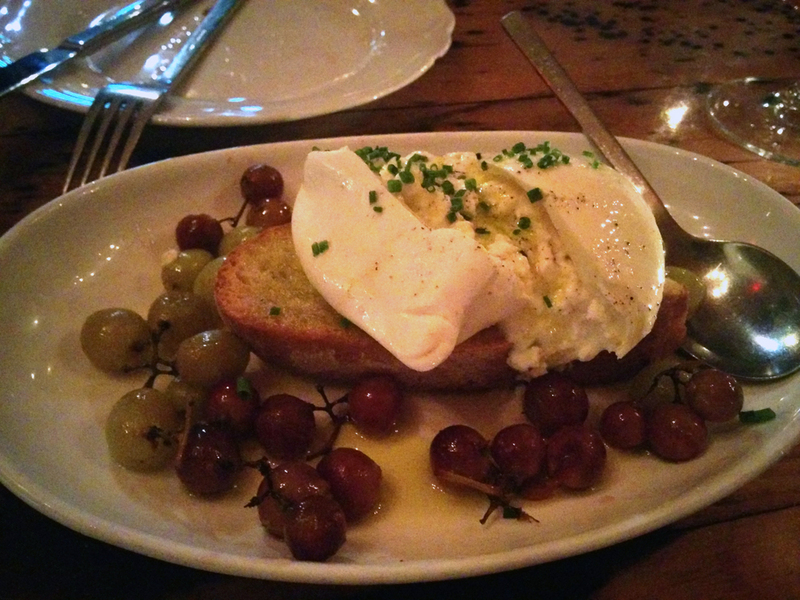 Best Italian had recently been updated, a new place out in our old neighbourhood: Campagnolo. Thankfully we managed to get a table. The place was packed, we watched people arrive and sit at the bar waiting for a table to open up. The menu was not entirely clear between entrees and appetizers. We had each ordered an appetizer as our main and a main to split as an appetizer. It turned out to be the perfect amount of food, given how many cookies we had eaten before leaving. We started off with the bone marrow. It was delicious and fun to eat. It was served in half a bone with a spoon for scooping it out. There were little pieces of bread to spread it on. Up next we had the fancy mozzarella on buttered bread. I am not a huge fan of cheese, except in its perfect form: melted. We were presented with a giant ball of cheese, under which you could barely see the bread, surrounded by warm grapes. The main was waygu steak. I had really high hopes for it, and migod did it deliver. The steak was amazing. It had been a long time between our appetizers and main. I joked that we were going to get a very well done steak, but secretly I was afraid that might happen- they had not asked how we wanted it done. We had not overdone it on the dinner, and I got my way: tiramisiu for dessert. You cannot go out for Italian and not have tiramisiu. It was delicious, with hazelnut flavour and the slightest hint of lemon at the bottom. Tags: Bar Isabel, Jacob's & Co.
Pinterest is a minefield for me. Every time I go on there I find myself following a long twisty path to a land of sweet temptations and end up with a mini-bloat of my I Will One Day Attempt To Make This board. I add more than I can make and I almost always end up stuck on a new recipe, wanting to make it so bad. Case in point: Reese stuffed cookies. No matter what, I could not resist making them. They were a must. I had wanted to make them for the house-warming party but our allergic-to-peanuts-friend* was supposed to attend so I ended up making the Twix brownies instead. The craving did not go away, in fact it got worse. Our anniversary was fast approaching, the perfect excuse for making them! Plus we were supposed to have a games weekend. I was too lazy to actually wrap cookie dough around Reese cups, so I tinkered the recipe and instead added mini-Reese cups. Out of habit, I ended up using the chocolate chip cookie recipe from my Tollhouse Cookie recipe book. Somehow the dough felt lacking, the Reese cups were too far apart (due to size) so I tossed in some chocolate chips and peanut butter chips. The dough was much tastier. 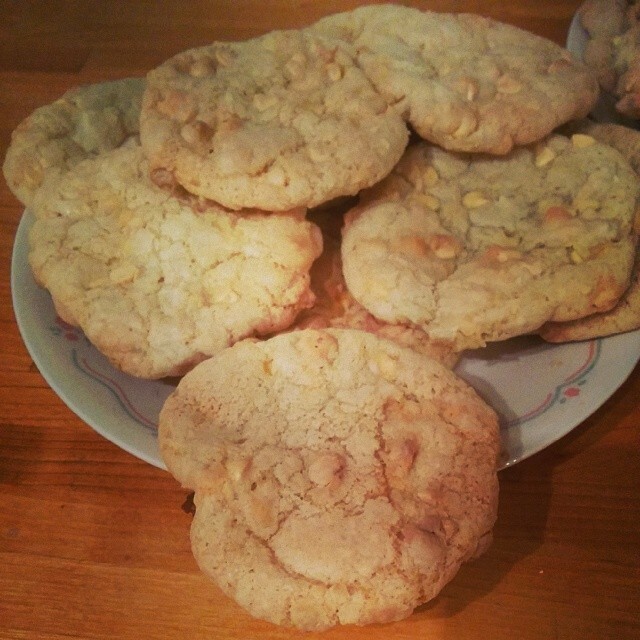 I made these in advance, I had a busy week coming up, and stuffed them in the freezer… not before baking myself a test one, just to make sure they were ok. Because we were expecting a games weekend, I did not bake all the cookies at once. Instead I kept the dough in the fridge and baked them on an as-needed-basis. In theory this sounds like a great idea to prevent overeating of these heavenly little cookies. 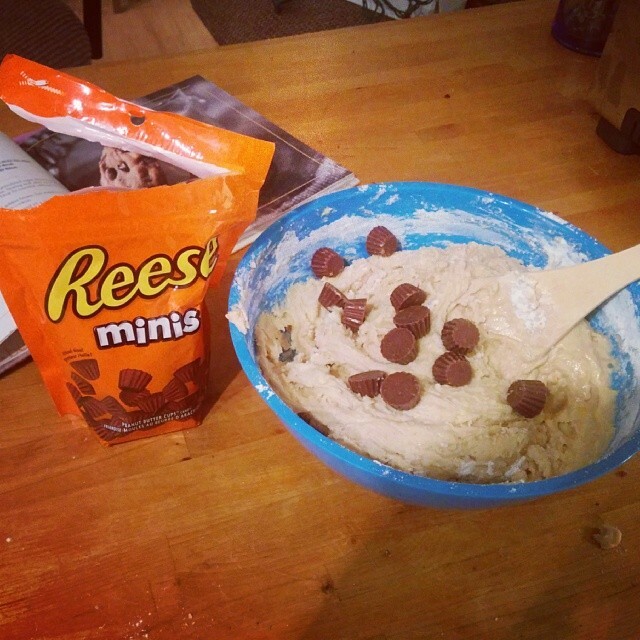 The trouble is that you instead end up overeating the cookie dough itself. These cookies are horribly addictive, you have been warned. I was craving cookies real bad. Then I read the AMA with Martha Stewart on reddit, wherein someone mentioned that their mom baked all the cookies from a Martha Stewart cookbook and that just about pushed me over the edge. But what kind of Martha Stewart cookies was I going to make? That was almost instantly settled when I found lemon chips (like chocolate chips) at Bulk Barn. Lemon Chip Cookies. No real recipe like that exists, so I used a basic lemon cookie recipe and just threw the lemon chips in hoping for the best. 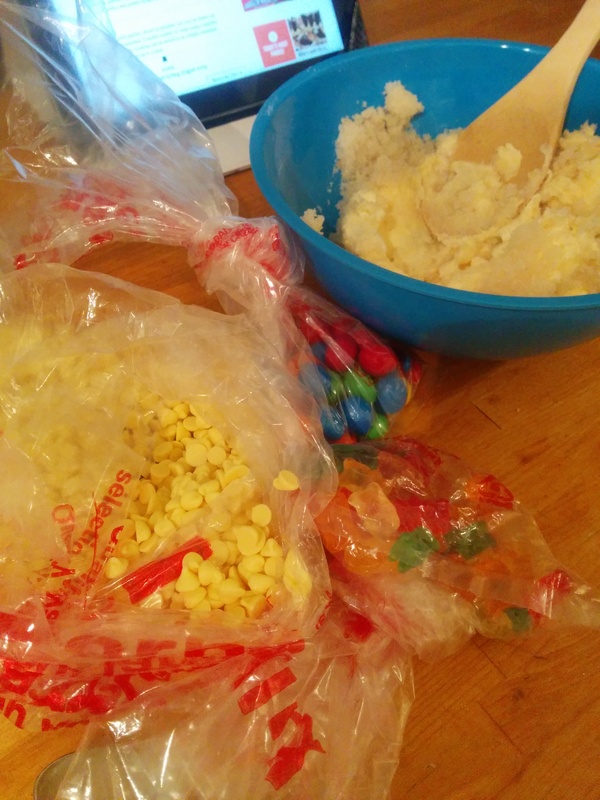 (As you can see, I had to buy more candy at Bulk Barn to keep myself from eating the lemon chips. It didn’t work). I unleashed a monster! 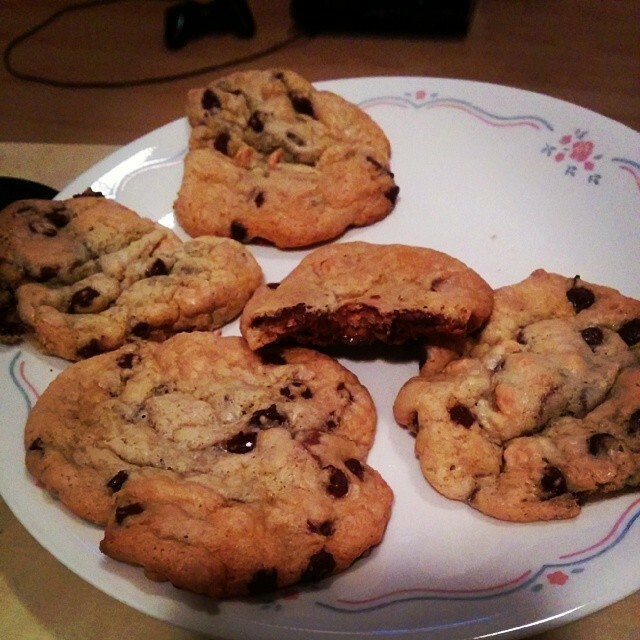 These cookies were easily the best cookies I have ever made. In one weekend we devoured them all. I could not, seriously could not, stop eating them. If you know me, you know I have a weak spot for pizza. I love, love, LOVE it. What’s not to love? It is a greasy soppy, cheesey mess! Hence the reason I was super excited when our plans last weekend involved going to get the city’s best pide (Turkish flat bread pizza) from Pizza Pide. I had ulterior motives however, when I googled the route it suggested taking Gerrard to Pape, for an extra 5 minutes we could avoid Gerrard and take Danforth instead. 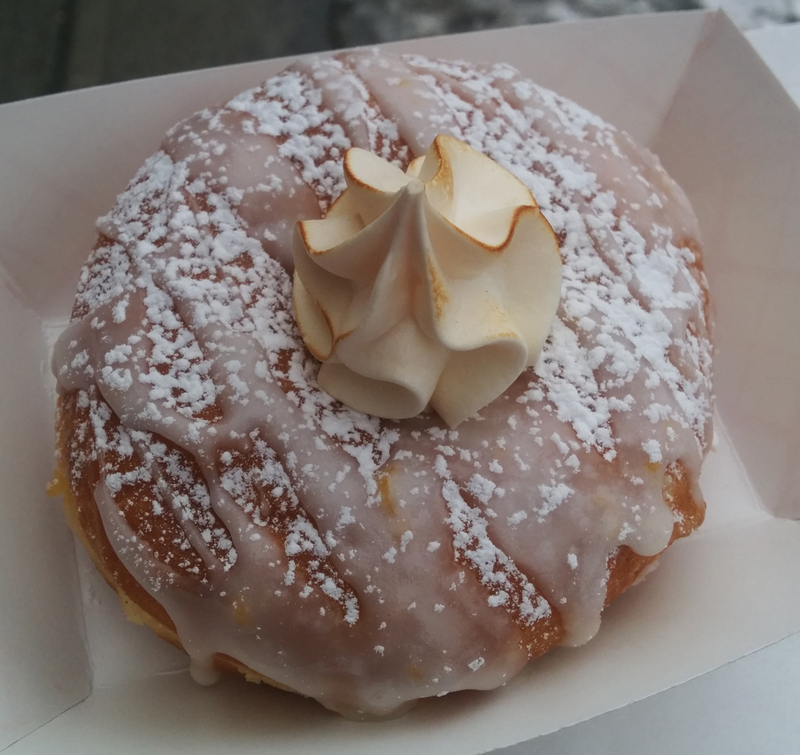 It just so happens that the newly opened Von Doughnuts is at Pape and Danforth, fancy that! It was decided that we would go there first and if they were sold out we would stop on the way back instead. Thankfully they were not sold out. We decided on three donuts, any more and it would be too much: a lemon donut with meringue and filling, chocolate mocha donut and a creme brulee donut. The donuts were light and fluffy and fresh. The lemon one was easily the best, the lemon filling was so good! I was not happy about the powdered sugar however, as that ended up all over my face and jacket and scarf. The creme brulee actually had a burnt sugar top to it. We arrived at Pizza Pide hungry, the donuts were just a snack. Brent ordered the most popular one in which each section had different toppings. I kept it simple and got the one with Turkish sausage. I tried a bite of each piece but gave up after the one with lamb- I am not a fan of lamb. The only other one left to try was the spinach, and I was ok with not trying it. The Turkish sausage was by far the best one. 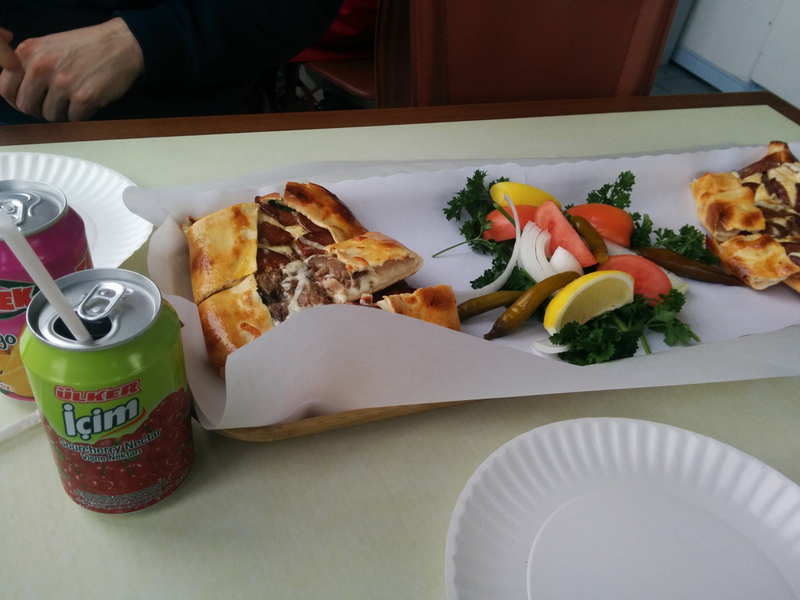 The pide was giant and unbelievably greasy, so much cheese crammed into that flat bread. It was just as good cold for dinner.